With a nearly 6-inch display, Google’s latest Nexus is downright unwieldy. It’s impossible to use effectively with one hand (and I have large hands). It doesn’t fit well in my pants pockets (and I have large pants). You can forget about taking it with you for a run. And yet, it’s hard not to love. That’s partially thanks to the top-shelf hardware and slick design of this Motorola-built phone, and partly because it’s a showcase for stock Android Lollipop (5.0), which is far more elegant and usable than any previous version. But it’s also true what the phablet-lovers have been saying for the past couple years: that an oversized phone is too big at first, but after a while, it’s hard to go back to anything smaller. The bigger displays just make these pocket computers more useful as, well, computers. And as our smartphones get more capable, it’s increasingly appropriate to recognize that they’re often our primary computing devices, and maybe a big screen is best. Is that a Nexus 6 in your pocket? I’m not used to phablets, and the Nexus 6 is the phablet-est of them all. It’s about as tall as an iPhone 6 Plus, but a quarter-inch wider. It’s almost a quarter inch taller and wider than the Galaxy Note 4. It took me several days of constant use to come to grips with the downsides: the need to stuff it in my bag or jacket instead of my pants pocket, or to hold it with one hand while tapping with the other, even just to reach the back button in the lower left corner. What a drag. 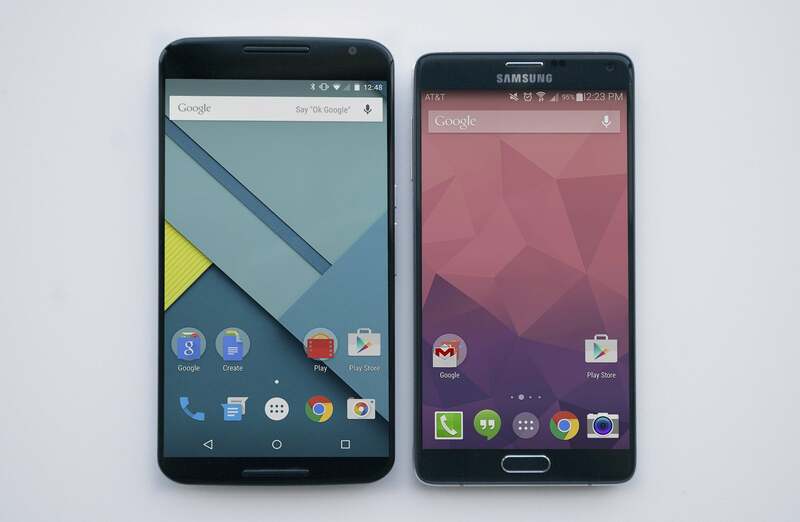 How big is the Nexus 6? Bigger than the sizable Galaxy Note 4, even! But with all the concessions you make in carrying around a phone apparently made for NBA players, you’ll also come to rely on the its benefits. A 6-inch, 2560x1440 screen is large and sharp enough to read webpages that aren’t explicitly designed for mobile. Watching YouTube and Netflix becomes an immersive joy, rather than an exercise in how long you can maintain a squint. Typing accuracy goes way up. Games are easier to play, with larger tap targets and more visible area around your thumbs. A phone this big makes you start to feel, dare I say, productive. Even when you’re just goofing off, you seem to be goofing off more efficiently. That huge chassis provides plenty of space for top-shelf hardware. That big AMOLED display is the star of the show. It’s big, fairly bright, and very sharp. Colors are a little too saturated, and whites have a slightly greenish tinge to them—these are common problems to AMOLEDs, but the Nexus 6 seems to suffer from them to a smaller degree than most. Oddly enough, the screen size and resolution makes Android default to a 5x5 grid of icons, instead of the typical 4x4. The extra real estate is nice, but most Android widgets top out at four icons wide, so they don’t fit the screen nicely. Even Google’s apps don’t have widgets five icons wide. The big high-res screen gives you a 5x5 grid of icons, but most Android widgets max out at 4 icons wide. The system-on-chip (SoC) is a Qualcomm Snapdragon 805 at 2.7GHz with 3GB of RAM. It’s the fastest phone SoC available today, and it shows. Scrolling is smooth, multitasking is immediate, games run flawlessly. Give credit to the SoC for some of that performance, and the efficiency of Android Lollipop for the rest. Of particular note is the broad wireless compatibility of this phone. It supports more GSM, CDMA, and LTE bands than nearly any phone I can recall. It will be available subsidized from all four major U.S. carriers (a first for a Nexus phone), and should work great overseas. The design of Google’s giant Nexus is very clearly derived from the Moto X (as it is made in partnership with Motorola, now a Lenovo company). It has the same gently curved back that makes the phone feel thinner than it is, leading to tapered edges that improve grip. The front is a single piece of smooth Gorilla Glass 3 that is dominated by the display, with very small bezels surrounding it. The flat front glass is disturbed only by a pair of speakers above and below the display. You know your phone is big when they had to move the buttons halfway down the side for you to be able to reach them. That’s right, stereo speakers. Combined with the large display, they make a huge improvement in your video-watching and game-playing experience. 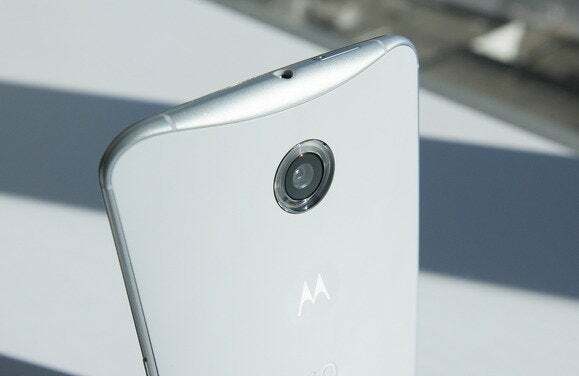 Google borrows more than just the shape of the Moto X. It cribbed a couple of that device’s best features, too. Ambient Display is similar to Moto Display: When a new notification comes in, or you pick up the phone, it lights up just enough pixels to show the notifications and time. It works great with Android Lollipop’s new lockscreen notifications, and won’t kill your battery. Thanks to a power-efficient DSP chip, the phone is always listening for “OK Google,” even if it’s sitting on your desk with the screen off and locked. The feature isn’t enabled by default, but once turned on it worked flawlessly and didn’t have much of a negative impact on battery life, either. From its curved back to its “ring flash” around the camera, the Nexus 6 looks like an oversized Moto X. For all the similarities with Motorola’s flagship phone, the Moto X still retains a few features for itself. While the Moto X has customizable backs and colors, the Nexus 6 only comes in midnight blue and white. The Moto X also has a greater array of voice commands, and gives you the ability to wave your hand over the phone to silence incoming calls. The camera hardware is better in the Nexus 6, but Motorola’s camera app, while unimpressive, is still better than the lame Google Camera app you get here. Skinned versions of Android—Samsung’s TouchWiz, HTC’s Sense and the like—are not without merit. For years they have provided useful features simply not present in stock Android. At least, not without downloading a slew of apps to modify Android’s look and behavior. 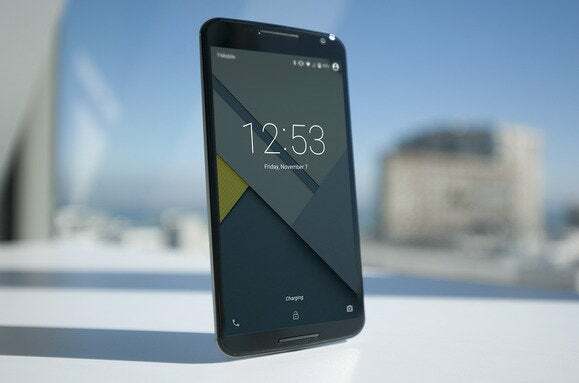 With Android Lollipop (5.0), the version whose promotion is at the heart of the Nexus 6, you scarcely have a need to look beyond the built-in functions. For example, you now get complete lock screen notifications (with the option to hide sensitive info, like email content). Notification Priorities mimic the “do not disturb” modes found in many manufacturer’s Android overlays. The quick settings shade is more elegant and useful. Guest mode locks down your phone so your kids don’t get a hold of personal stuff. And now you can “pin” a single screen so your friend doesn’t start swiping all around your phone when you’re trying to show him a picture. 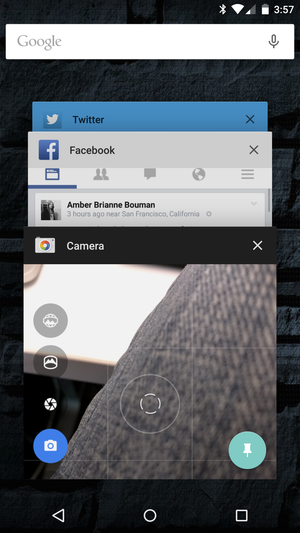 Android 5.0 lets you “pin” an app, preventing phone borrowers from browsing through your other stuff. Android enthusiasts and developers have long preferred Nexus devices precisely because they offer an unadulterated, “pure” Android experience. But for everyday users, the amount of customization and third-party apps necessary to bring stock Android up to modern standards was a problem. With Lollipop, the basic Android OS has added the cupholders and heated seats necessary for a comfortable ride. If there’s a serious drawback to Google’s beastly new phone, it’s the camera. This is a Nexus, and that means stock Android, and that means Google’s standard Camera app. It’s awful. Mind you, the Nexus 6 hardware is up to snuff. It’s got a 13-megapixel Sony IMX214 sensor, f/2.0 lens, with optical image stabilization, and a dual-LED flash. The resulting shots are quite good, and even the low-light performance is a big step up from previous Nexus phones. With HDR+ mode enabled, you can get some really nice shots. The Nexus 6 (left) delivers decent low-light shots, thanks to a good sensor, f/2.0 lens, and OIS. Compare to Galaxy S5 (right). But the experience of taking photos is abysmal. The interface for Google’s Camera app is simple to the point of fault. It lacks many basic options and features you find on every modern smartphone. All this high-end hardware and there’s no burst mode? No slow motion video? The shutter lag and shot-to-shot latency is way too long. In bright light, the Nexus 6 camera (left) delivers nice white balance and color tones. Galaxy S5 on right. It’s hard to imagine how it ended up this way. 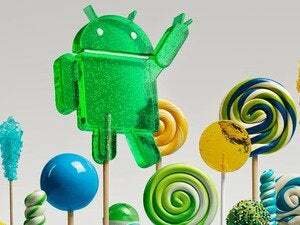 Android Lollipop brings with it a new camera API that gives developers unprecedented control over camera hardware and raw access to the sensor data. Finally, Android camera apps can match their iOS counterparts, with smooth viewfinder updates, fast burst modes, HDR video, better post-processing, quick shutter performance, and manual focus and exposure controls. How is Google’s own Camera app, on its flagship Nexus device, not a proving ground for what’s possible? It doesn’t appear to take advantage of any of the new camera API features at all. There are a few camera apps that deliver some of these things today, but so far none have been updated to use the new Android 5.0 camera API, so they’re sort of limited. Until we see some new or updated camera apps in the Play Store, or Google improves its awful Camera app, the Nexus 6’s fine hardware remains hamstrung. The Nexus 6 supports Qualcomm’s Quick Charge 2.0 technology, meaning that it can charge a nearly-dead phone very quickly if you have a compatible charger. Charging speed tapers off as the battery gets full, it’s still immensely useful. I went from 27 percent charged to 52 percent in 15 minutes. Many other phone makers incorporate this same technology, sometimes giving it their own brand name. They almost always sell the turbo charger separately—Google packs it in the box. Even with Ambient Display and the always-on hotword detection on, I never failed to go all day on a single charge. 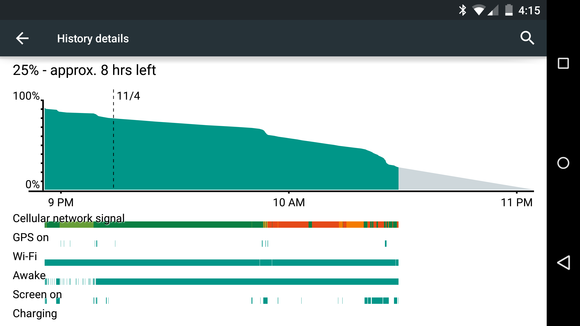 You can bring the Nexus 6 back from the brink of death very quickly, but this may not be necessary all that often, as the battery lasts quite long. Unfortunately, many of the apps we rely on to perform battery benchmarks do not yet work properly under Android Lollipop, so a proper battery benchmark score will be added here in the future. That said, in over a week of use, I never had to charge the phone twice in a single day. It easily lasted over 24 hours with about 3.5 hours of screen-on time in moderate use. That’s with the brightness set above average, and adaptive brightness, Ambient Display, and always-listening features enabled. Even if you’re a fairly heavy user, you probably won’t have to plug in before you go to bed. It’s also the most expensive Nexus phone yet. At $649, it costs hundreds more than the Nexus 5. The price isn’t half bad, actually. Consider that other huge phones like Galaxy Note 4 and iPhone 6 Plus cost $100 more, and for that price the iPhone gives you half the storage. You get what you pay for. Your biggest fear about the Nexus 6 is probably its size. Frankly, it doesn’t need to be so big. But you’ll get used to it, and in time, you’ll look at “little” 5-inch phones like they’re toys. Your concern should be the camera. The hardware is there, but Google does not provide camera software worthy of it, and other developers have not yet stepped up to the plate. It’s a shame to see such a lovely phone, and the best Nexus yet, tarnished by once again delivering a lackluster photo-taking experience. If you can live with that, or if you have faith that improved camera software is right around the corner, you’ll find this to be the easiest Nexus phone to live with, despite (or perhaps because of) it’s staggering size. The biggest, most expensive, and best Nexus phone Google has ever produced. All it needs is decent camera software.